The last consultation meeting took place today in Vienna, including representatives of the city, Rapid and residents living close to the future construction site. With no objections from the community Rapid is now clear to start their project. Not the construction part yet, because a final planning permission hasn’t been granted so far. But this should happen on November 5. Besides, before starting construction they need to demolish the existing stadium. Rapid decided to address the fans and make the Gerhard-Hanappi-Stadion an “all you can carry” buffet. On Saturday, October 4, supporters are welcome to come and take whatever they want – seats, pieces of the turf or even chunks of concrete. Pickaxes may come in handy. Just two days later, on Monday, heavy machinery will take over, beginning demolition of whatever is left. Currently all indications say groundbreaking on the new stadium will happen as planned, in February 2015. 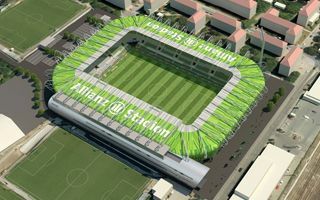 By June 2016 the new 28,000-capacity Allianz Stadion should be ready.